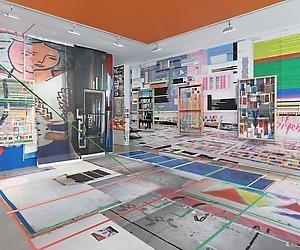 This is a view into a manic installation called “paintingassupermodel,” by Franklin Evans. 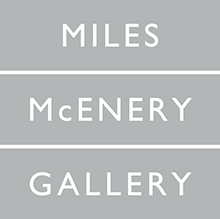 It’s now filling the Ameringer McEnery Yohe gallery in New York. The title is a clever updating of “Painting as Model,” the name of a famous 1993 book by art historian Yve-Alain Bois, sped up to the pace of the 21st century. There’s not even time for a break between words. Evan’s installation does a pretty good job conjuring the feel of art as it is now experienced, as a ceaseless barrage of image and information and commerce that we’re supposed to take as-is, without too much processing or doubt. “Paintingassupermodel” levels the playing field between Matisse and Photoshop. What I couldn’t decide, as I took in the piece, was whether its frantic complexities acted as an invitation to dig deep to figure them out, or to skim along across their surfaces.